The UX pioneer reflects on a decade spent pushing boundaries at Clearleft and Twitter. Cennydd Bowles will be speaking at Generate London, 21-23 September. In his session, All singing, all dancing, he'll be exploring the potential of sound and motion in digital products, and how together they can help bring life and clarity to the things we make. Book your ticket now! Speaking to Cennydd Bowles at his London home is a tricky business. It's not that he's hesitant to talk about his past work at Clearleft and Twitter, or his strong views about the ethics of design. It's just that everyone else wants to talk to him too. Our interview is peppered with his phone bleeping, then buzzing, as people try to get through to him. 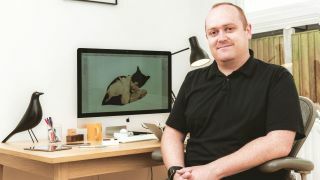 With an impressive 13 years in the notoriously protean web industry as a user experience designer (a term he uses, but isn't fond of) Bowles hasn't just remained relevant - he's currently at the top of his game. And he's also branching out into teaching: running workshops where he can share his experience. Bowles (whose first name is pronounced Kenneth – "the reason it's spelled so weirdly and Welshly is because I am a Welshman") is under no illusion about teaching. There are only so many times you can tell someone to 'be focused, work hard, and success will follow'. To excel in the UX game, it's important to have certain character traits. "People who do this kind of work are the kind of people who would be doctors or social workers, but they're too squeamish, or they're not good enough with people face-to-face," he says. The key to success is not just the determination and aptitude for delving into a complex field; it comes down to wanting to do good. "[UX designers] generally have a desire to improve, you know, humanity," he says. "They want to improve things for people and to put people at the centre of the system." It also helps to be a system-level thinker – and possibly a little reclusive. "There's something about the combination of altruistic desire to improve the world, and having that system-level intuitive thinking that means you can piece relatively unrelated ideas together," says Bowles. "There's also some introversion on the side. I think we skew fairly introverted as a community." Born in Carmarthen, Bowles moved to Shrewsbury with his mum when he was three or four, and split his time between South Wales and the Midlands growing up. He was drawn to music, learning piano and violin to a reasonable level, and chess "enough to beat people that didn't play chess". After getting a physics degree, he went on to a master's in IT, where modules on human-computer interaction hooked him in. "I had gone in with the typical arrogance of a 20-year-old programmer thinking, 'Design a form? Yeah I can do that,' then realised that's where the complexity lay for me," he says. Interaction design in the UK – or, indeed the world – wasn't terribly well-developed a decade ago, so Bowles had to "try to wend my own way, to plough my own furrow and turn positions I'd had into that kind of job." He worked for the government for five years, ostensibly as a 'web person' , but was forever trying to bend his work towards information architecture and UX. It was a lonely business. There wasn't much similar work going on in the UK, particularly in Nottingham, where Bowles had stayed on after university. "I suspect I was the only person doing what I was doing in the city. It was an interesting, lonely experience figuring it out for myself. It was only when I moved to London, and even a couple of years after that, that the user experience community really exploded." In 2007, he got a lead UI position at price comparison site uSwitch, where he tried "to explain to others the benefit of user-centred thinking ... trying to prove it by doing it." It was when he landed a job at Clearleft that Bowles hit his stride. Having met agency co-founder Andy Budd, the two got chatting and found that they had shared values. Clients like Samsung, the Open University and Gumtree came to Clearleft "because they knew the value of not treating design as a cost, but as an investment." They were also the kind of clients with enough forethought to put digital at the heart of what they were doing. Working with the likes of Budd, Jeremy Keith, Natalie Downe and James Box taught Bowles the value of surrounding yourself with excellence, but after three years at Clearleft, he found himself looking for a new challenge. "I needed some space to figure out what was next in my career," he says. "At that stage, I was trying to write another book, which I actually failed to do. I was writing it fairly quickly but the field was changing quicker. I was 25,000 words in and further away from the end than when I started." This was around 2011, when responsive design was becoming a mainstream activity. More people were paying attention to mobile and tablets, and device categories were becoming much more diverse. "I was trying to write almost a grand unified theory of how to design for all of those [platforms] and it was just too much," laughs Bowles. The ill-fated book was a symptom of Bowles' restlessness. "I wasn't developing as a designer; I was coasting, to be honest. It got to the stage where I really wanted to get my head down and push myself to try to ship something high-impact with the very best team I could partner with. And it was around that time that Twitter were looking for their first design hire outside of the States." Bowles joined Twitter in May 2012. At the time, the global design team was made up of around 30 people, almost all of whom were in San Francisco, plus a couple in New York and then Bowles in London. He worked with local engineers and grew the London design team to six people. "We also got a motion designer and prototyper hired in London, so I spent a lot of time working with him, trying to set standards for Twitter: what should move, when, how, why? How does it convey the experience, the brand identity? How do you see something and say, 'That's a uniquely Twitter-y interaction?' How can you improve the user experience through animation?" Was some of this new to Bowles? Yes. Was he forced out of his comfort zone? Absolutely. "It's easy sometimes to say, 'I've hit a rich vein; a seam of interesting or profitable work,' which is wonderful, but you can find yourself heading towards obsolescence without realising it. As a designer I had to have an appetite to learn new things and say, 'This might not be my speciality but I'm going to get stuck in and do it anyway.'" A lot of time was spent identifying prototyping tools for the team to use; then towards the end of his time there Bowles worked on an emerging market project. "I can't talk too much about that because it's not fully public yet, but I was working with the local team to try to improve the experience of Twitter for people in emerging markets, people with bandwidth constraints, who aren't just going to download the full-featured Android client and burn through 50 meg of data in a day." Bowles' most recent example of evolutionary responsive work is the TweetDeck 3.0 redesign, which was internally codenamed 'Evo'. "The reason I chose that name was essentially political, to try to explain that this wasn't a redesign that should require enormous upheaval and scrapping of code and big deadline-chasing stuff," says Bowles. "We'd been bitten by stuff like that before. I was keen to express to the team that the changes we were making were a natural improvement of what we had currently." This puts Bowles in the evolution-over-redesign camp, keeping the user at the centre of all design decisions. He set up user research on the core audience of TweetDeck – which, at the time, was journalists. "I spent time on the BBC newsroom floor, at the Guardian and various other places, really understanding what they wanted from Twitter." Throughout, he conformed to the ideal of delivering the most advanced evolution of the product possible without creating a huge upheaval for the users. "As a product designer, you always strive to push things forward, but you're always held back. Your existing users need to understand what's happening, why you're going in that direction [and] what's in it for them, in particular. If you go too far ... if you get too bold too quickly, you lose them. At the very least, you destroy the habits they've formed and the product they loved is no longer there." Instead, Bowles focused on creating a clearer visual identity for the product and improved interaction design to encourage users to linger. They also brought TweetDeck's design language – which reflected its origins as a third-party product – in line with that of Twitter itself. Some of these problems were already solved, with known patterns to draw upon, and style guides to adhere to, freeing Bowles up to focus on the challenges where such precedents did not apply, and a new approach had to be taken. Interestingly, Bowles believes that it's easier to try to get a new product out of the door as soon as possible at a big company like Twitter. But that's not to say corners were cut: "We had a really high quality bar," he says. "I spent a lot of time making sure that the rough edges were rounded off." Just as was the case with his work at Clearleft, the team assembled around Bowles played a key role in the project's success. "I had the support of an excellent product manager who really saw the value in that kind of thing," he says. "[The keys to success are] team effort, knowing your users and having that high quality bar so you're confident you're shipping something the entire team is proud of – something they are happy to sign their names to." And with that, with everything seemingly going as well as possible, Bowles has drawn his tenure as Twitter's design manager to a close, and moved on to the next – and still unwritten – chapter of his ever-evolving career. Don't miss All singing, all dancing, Cennydd's talk at Generate London. He'll be there alongside leading industry names such as Jeff Veen, Mike Kus, Ida Aalen and Brendan Dawes for three days of practical workshops and inspiring talks that'll help you turbo-charge your career; book now! This article originally appeared in net magazine issue 268; subscribe today!